Since 1946, it has played a major role in Syria's governance, mounting six military coups: two in 1949, including the March 1949 Syrian coup d'état and the August 1949 coup by Colonel Sami al-Hinnawi, and one each in 1954, 1963, 1966, and 1970. It has fought four wars with Israel (1948, the Six-Day War in 1967, the October War of 1973, and 1982 in Lebanon) and one with Jordan (Black September in Jordan, 1970). An armored division was also deployed to Saudi Arabia in 1990–91 during the Persian Gulf War, but saw little action. From 1976 to 2005 it was the major pillar of the Syrian occupation of Lebanon. Internally, it played a major part in suppressing the 1979–82 Islamist uprising in Syria, and since early 2011 has been heavily engaged in fighting the Syrian Civil War, the most violent and prolonged war the Syrian Army has taken part in since its establishment in the 1940s. In 1919, the French formed the Troupes spéciales du Levant as part of the Army of the Levant in the French Mandate for Syria and the Lebanon. The former with 8,000 men later grew into both the Syrian and Lebanese armies. This force was used primarily as auxiliaries in support of French troops, and senior officer posts were held by Frenchmen, although Syrians were allowed to hold commissions below the rank of major. As Syria gained independence in 1946, its leaders envisioned a division-sized army. On June 19, 1947, the Syrian Army took the survivors of Pan Am Flight 121 to the Presbyterian mission hospital at Deir ez-Zor. The 1st Brigade was ready by the time of the Syrian war against Israel on May 15, 1948. It consisted of two infantry battalions and one armored battalion. The 2nd Brigade was organized during the 1948 Arab–Israeli War and also included two infantry battalions and one armored battalion. At the time of the 1948 Arab–Israeli War, the army was small, poorly armed, and poorly trained. "Paris had relied primarily on French regulars to keep the peace in Syria and had neglected indigenous forces. Consequently, training was lackadaisical, discipline lax, and staff work almost unheard of. ... there were about 12,000 men in the Syrian army. These troops were mostly grouped into three infantry brigades and an armored force of about battalion size" writes Pollack. Between 1948 and 1967, a series of military coups destroyed the stability of the government and any remaining professionalism within the army. In March 1949, the chief of staff, General Husni al-Za'im, installed himself as president. Two more military dictators followed by December 1949. General Adib Shishakli then held power until deposed in the 1954 Syrian coup d'etat. Further coups followed, each attended by a purge of the officer corps to remove supporters of the losers from the force. 'Discipline in the army broke down across the board as units and their commanders pledged their allegiance to different groups and parties. Indeed, by the late 1950s, the situation had become so bad that Syrian officers regularly disobeyed the orders of superiors who belonged to different ethnic or political groups' writes Pollack. The 1963 Syrian coup d'état had as one of its key objectives the seizure of the Al-Kiswah military camp, home to the 70th Armored Brigade. There was another 1966 Syrian coup d'etat. However, in 1967 the army did appear to have some strength. It had around 70,000 personnel, roughly 550 tanks and assault guns, 500 APCs, and nearly 300 artillery pieces. The army had sixteen brigades: twelve infantry, two armored (probably including the 70th Armored), and two mechanized. The Syrian government deployed twelve of the sixteen brigades to the Golan, including both armored brigades and one mechanized brigade. Three 'brigade groups', each comprising four brigades, were deployed: the 12th in the north, holding the sector from the B'nat Ya'acov bridge to the slopes of Mount Hermon, the 35th in the south from the B'nat Ya'acov bridge to the Yarmuk River border with Jordan, and the 42nd in reserve, earmarked for a theater-level counterattack role. During the Six-Day War Israeli assault of the Golan heights, the Syrian army failed to counterattack the Israelis as the Israelis breached the Syrian positions. While Syrian units fought hard whenever the Israelis entered their fields of fire, no attempts appear to have been made to exploit Israeli disorientation and confusion during the initial assault. Judging from reports of 1967–1970, including the reporting of the 5th Infantry Division in 1970, the Army appears to have formed its first divisions during this period. The 1st and 3rd Armored Division, and 5th, 7th, and 9th Mechanized Infantry Divisions were all formed prior to 1973. Samuel M. Katz writes that after Hafez al-Assad gained power in November 1970, the army expanded to the five divisions listed above, plus ten independent brigades, an artillery rocket brigade (the 69th), and "a reinforced brigade variously termed the 70th Armored Brigade or the Assad Republican Guard. It is today known as the Armored Defense Force; as Assad's praetorian guard it is stationed in and around Damascus and subordinate to the Defense Companies under the command of Assad's brother Rifa'at." On 18 September 1970, the Syrian government became involved in Black September in Jordan when it sent a reinforced armored brigade to aid the Palestine Liberation Organization. Syrian armored units crossed the border and overran Irbid with the help of local Palestinian forces. They encountered several Jordanian Army detachments, but rebuffed them without major difficulty. Two days later, the 5th Infantry Division, heavily reinforced, was also sent into Jordan. Two armored brigades were attached to the division, bringing its tank strength up to over 300 T-55s and its manpower to over 16,000. The division entered Jordan at ar-Ramtha, destroyed a company of Jordanian Centurion tanks there, and continued directly towards Amman. Pollack says it is likely that they intended to overthrow the Jordanian monarchy itself. Despite defeating the Jordanian Army at al-Ramtha on 21 September, after fierce air attacks on 22 September, the Syrians stopped the attack and began to retreat. The Syrian armed forces have also been involved in suppressing dissident movements within Syria, for example the Islamist uprising in Syria in 1979–1982. In March 1980 the 3rd Armored Division and detachments from the Defense Companies arrived in Aleppo. The division was under the command of General Shafiq Fayadh, Hafiz Assad's first cousin. The troops sealed "off whole quarters and carr[ied] out house-to-house searches, often preceded by tank fire." Hundreds of suspects were rounded up. Only two conventional Army brigades deployed to Hama in 1982, the 3rd Armored Division’s 47th Armored and 21st Mechanized Brigades. Three quarters of the officers and one third of the soldiers in the two brigades were Alawites. Most of the repression was carried out by the Defense Companies and the Special Forces. Meanwhile, the Special Forces were isolating and combing through Hama, killing and capturing suspected government opponents. 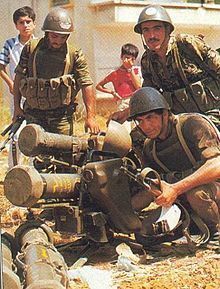 Syrian forces fought Israel during the 1982 Lebanon War. In 1984, Major General Ali Haidar's Special Forces were instrumental in blocking an abortive attempt by Rifaat Assad and his Defense Companies to seize the capital. Fayadh's 3rd Armored Division moved into the capital to join Haidar's forces in the confrontation with the Defense Companies. The 3rd Armored Division, it seems, had historically been based at al-Qutayfah, near Damascus. A Syrian colonel during the First Gulf War. The 9th Armored Division served in the 1991 Persian Gulf War as the Arab Joint Forces Command North reserve and saw little action. In 1994, Haidar expressed objections to the Syrian president's decision to bring Bashar home from his studies in Britain and groom him for the succession after the death of Basil, the eldest Assad son. Soon afterwards, on 3 September 1994, Jane's Defence Weekly reported that then-President Hafez Assad had dismissed at least 16 senior military commanders. Among them was Haidar, then commander of the Special Forces, and General Shafiq Fayadh, a cousin of the President who had commanded the "crack" 3rd Armored Division for nearly two decades. The 3rd Armored Division was "deployed around Damascus." JDW commented that "the Special Forces and the 3rd Armored Division, along with the 1st Armored Division are key elements in the security structure that protects Assad's government. Any command changes involving those formations have considerable political significance." Post-uprising reporting indicated the 1st Armored Division had historically been at al-Kiswah. On 29 September 2004, Jane's Defence Weekly reported that Syria had begun to redeploy elements of one or more Syrian Army special forces regiments based in the coastal hills a few kilometres south of Beirut in Lebanon. A senior Lebanese Army officer told JDW that the 3,000 troops involved would return to Syria. Cordesman wrote that in 2006 the Syrian Army had "organized two corps that reported to the Land Forces General Staff and the Commander of the Land Force." In 2009 and 2010, according to the International Institute for Strategic Studies in London, the Syrian army comprised 220,000 regular personnel, and the entire armed forces (including the navy, air force and air defenses) had 325,000 regular troops. Additionally, it had about 290,000 reservists. At October 1, 2011, according to high-ranking defected Syrian Colonel Riad Assaad, 10,000 soldiers, including high-ranking officers, had deserted the Syrian Army. Some of these defectors had formed the Free Syrian Army, engaging in combat with security forces and soldiers in what would turn into the Syrian Civil War. At 16 November 2011, Rami Abdel Rahman, the head of the UK-based Syrian Observatory for Human Rights, however estimated that less than 1,000 soldiers had deserted the Syrian Army; at the same moment, an FSA battalion commander claimed that the FSA embraced 25,000 army deserters. Also in November 2011, the Free Syrian Army or the website of France 24 estimated the Syrian Army at 200,000 troops. According to General Mustafa al-Sheikh, one of the most senior defectors, however, in January 2012 the Syrian forces were estimated at 280,000 including conscripts. By March 15, 2012, many more soldiers, unhappy with crackdowns on pro-democracy protesters, switched sides and a Turkish official said that 60,000 soldiers had deserted the Syrian army, including 20,000 since February 20. It was added that most of the deserters were junior officers and soldiers. By 5 July 2012, the Syrian Observatory for Human Rights estimated "tens of thousands" soldiers to have defected. By August 2012, 40 Brigadier generals from the Army had defected to the opposition army, out of a total of 1,200 generals. On June 14, 2013, 73 Syrian Army officers and their families, some 202 people in total, sought refuge in Turkey. Amongst their number were seven generals and 20 colonels. By August 2013, the strength of the Syrian army had, compared with 2010, roughly been cut in half, due to defections, desertions and casualties, according to the International Institute for Strategic Studies in London: it now counted 110,000 troops. Up until July 2012, the scale of defections from the Syrian Army, though hard to quantify, was too small to make an impact on the strength of that army, according to Aram Nerguizian from the Washington-based Center for Strategic and International Studies. Strategically important units of the Syrian armed forces are always controlled by Alawite officers; defecting soldiers – by July 2012 "tens of thousands" according to the Syrian Observatory for Human Rights – are mainly Sunni without access to vital command and control, Nerguizian said. Analyst Joseph Holliday wrote in 2013 that "the Assad government has from the beginning of the conflict been unable to mobilize all of its forces without risking largescale defections. The single greatest liability that the Assad regime has faced in employing its forces has been the challenge of relying on units to carry out orders to brutalize the opposition." This has resulted in Bashar's following his father's precedent by attaching regular army units to more reliable forces (Special Forces, Republican Guard, or 4th Armored Division). When Hafez al-Assad directed the suppression of revolts in Hama in 1982, this technique was also used. The Syrian Arab Army suffers from serious recruitment issues as the Syrian Civil War drags on, with military age men across sectarian lines no longer willing to join or serve their conscription terms. These issues are especially notable among the Druze population, who have clashed with regime security forces and broken Druze youths out of regime imprisonment to avoid them serving in the army. Increasingly, Assad's Alawite base of support refuse to send their sons to the military due to massive casualty rates among military age men in their community; a third of 250,000 Alawite men of fighting age have been killed in the Syrian Civil War, leading to major tensions between the sect and the Assad regime. As of mid-2018, then-Israeli Defence Minister Avigdor Lieberman said that the Syrian Arab Army had regained its pre-2011 strength levels, recovering from manpower shortages earlier in the Syrian Civil War. The 3rd Armored Division has deployed elements of three brigades from its bases around Qutayfah to Deraa, Zabadani, and Hama, while the 11th Armored Division has stayed close to its bases in Homs and Hama. The European Council named Major General Wajih Mahmud as commander of the 18th Armored Division in the Official Journal of the European Union on 15 November 2011, sanctioning him for violence committed in Homs. Henry Boyd of the IISS noted that "in Homs, the 18th Armored Division was reinforced by Special Forces units and ... by elements of the 4th Division under Maher's de facto command." Information from Holliday 2013 suggests that the reserve armored division is the 17th (rather than any other designation), which was responsible for eastern Syria. The division's 93rd Brigade left Idlib to secure Raqqa Governorate in early 2012. Following the reported capture of Raqqa on 3–6 March 2013, elements of the 17th Division remained under siege to the north of the city in October 2013. The National Defense Force is under the control and supervision of the Syrian Army and acts in an infantry role, directly fighting against rebels on the ground and running counter-insurgency operations in co-ordination with the army which provides them logistical and artillery support. Struggling with reliability issues and defections, officers of the SAA increasingly prefer the part-time volunteers of the NDF, who they regard as more motivated and loyal, over regular army conscripts to conduct infantry operations and act as support for advancing tanks. An officer in Homs, who asked not to be identified, said the army was increasingly playing a logistical and directive role, while NDF fighters act as combatants on the ground. In October 2015 the 4th Assault Army Corps (Arabic: 4 فيلق اقتحام) was established in the northeast. The NDF continues to play a significant role in military operations across Syria despite the formation of other elite units, many of which receive direct assistance from Russia. Richard Bennett wrote in 2001 that "three corps [were] formed in 1985 to give the Army more flexibility and to improve combat efficiency by decentralizing the command structure, absorbing at least some of the lessons learned during the Israeli invasion of the Lebanon in 1982." The organization and military doctrine of the army followed the Soviet model. A Syrian soldier aims a Type-56 assault rifle from his position in a foxhole during Operation Desert Shield. 1st Corps HQ Damascus, which covered from Golan Heights, the fortified zone and south to Der'a near the Jordanian border. 9th Armored Division, with the 43rd and 91st Armored Brigades and the 52nd Mechanized Brigade. A Syrian soldier aims a 7.62mm PKM light machine gun from his position in a foxhole during a firepower demonstration, part of Operation Desert Shield. The soldier is wearing a nuclear-biological-chemical warfare mask. Bennett said the 1st Corps also [had] four independent special forces regiments, including two trained for heliborne commando operations against the Israeli signals intelligence & observation posts on Mount Hermon and elsewhere in the Golan Heights. 2nd Corps (Syria) HQ Zabadani, covers north of Damascus, to Homs and includes Lebanon. 10th Mechanized Division, headquartered in Shtoura, Lebanon. Its main units [were in 2001] deployed to control the strategic Beirut-Damascus highway with the 123rd Mechanized Brigade near Yanta, the 51st Armored Brigade near Zahle in the Beqaa Valley and the 85th Armored Brigade, deployed around the complex of positions at Dahr al-Baidar. three other heavy brigades from the 3rd and 11th Armored Divisions [were] known to be regularly deployed to eastern Lebanon. there [were] five special forces regiments in the Lebanon. 3rd Corps HQ Aleppo, based in the north and covered Hama, the Turkish and Iraqi borders, the Mediterranean coastline and was tasked with protecting the complex of chemical and biological warfare and missile production and launch facilities. The 2nd Reserve Armored Division, with the 14th and 15th Armored Brigades and the 19th Mechanized Brigade. The 2nd [was] also believed to operate as the main armored forces training formation. It seems likely that the "2nd" designation, reported in 2001, was incorrect, as it has not been reported during the Syrian Civil War. Other units under the control of this corps included four independent infantry brigades, one border guard brigade, one independent armored regiment, effectively a brigade group, and one special forces regiment. the Coastal Defense Brigade, which [operated] largely as an independent unit within the 3rd Corps area, [was] headquartered in the naval base of Latakia with four Coastal Defense Battalions in Latakia, Banias, Hamidieh and Tartous. Each Battalion has four batteries of both the short range SSC-3 Styx and long range SSC-1B Sepal missile systems. The Republican Guard Armored Division, with three Armored brigades, one Mechanized brigade, and one artillery regiment. Marine Regiment (Fouj Al-Mughawayr Al-Bahar). Established in February 2016, during the Latakia offensive (2015–2016). Note: "Special Forces" in the Syrian Arab Army denotes specialized "light" infantry (airborne, air assault) and are "elite" only in relation to the conventional mechanized, armored units of the SAA. Special Forces units include the: 41st, 45th, 46th, 47th, 53rd and 54th independent special forces regiments. Desert Hawks Brigade (Liwa Suqur al-Sahara). Formed in 2013, disbanded in 2017. 52nd Mechanized Brigade. The 52nd Armored Brigade was reported in Der'aa in southern Syria in May 2013. On February 24, 2016, abna24.com reported that "Last Spring, the Syrian Arab Army's 87th Brigade of 11th Tank Division began their massive retreat across the Idlib Governorate, conceding the provincial capital and the strategic cities of Ariha and Jisr Al-Shughour to Jaysh Al-Fateh (Army of Conquest) en route to their embarrassing exit from this province in northern Syria." The "4th Corps", "4th Assault Corps", or "4th Volunteer Assault Corps", , also called the Fourth Legion - Assault is a new formation of the Syrian Army, organized with Russian help since 2015. The original plan for the 4th Corps was to reorganize the weakened regular army units as well as irregular pro-government militias, including some National Defence Forces (NDF) units, in the governorates of Latakia as well as Tartus, and on the al-Ghab Plain. These forces would be trained, organized and armed by the Russian Armed Forces, so that they could become "special" ground forces which would retake northernwestern Syria with Russian air support. When the 4th Corps was subsequently organized in summer and fall 2015, forces of widely different origins were included: Among these were the 103rd Republican Guard Brigade which would serve as HQ for the new corps, along with troops drawn from the 3rd and 4th Divisions, as well as Ba'ath Party, NDF, and Alawite militias. The Alawite fighters were organized into 12 units which fought under the joint command of Russian, Syrian, and Iranian officers. The remained was grouped into four "volunteer brigades", while several smaller Russian units were assigned to it in a support role. Directly paid by the Republican Guard and the government, the 4th Corps was described by Carnegie Middle East Center's expert Kheder Khaddour a formation that "blends army and militia forces". Although the 4th Corps' initial operations such as during the 2015–16 Latakia offensive and Northwestern Syria offensive (October–November 2015) were relatively successful, the inclusion of more militias into the corps remained elusive. This was probably due to the fact that Iran remained unwilling to allow Syrian units under its control to be integrated to a primarily Russian-led formation, while many militias generally resisted any attempts to reduce their autonomy by including them in the 4th Corps. As result, the 4th Corps remained mostly limited to Latakia, where it continues to be active. As its performance during the 2016 Latakia offensive was lacking, however, its overall commander Maj. Gen. Shuqi Yusuf was dismissed in July 2016. Overall, the 4th Corps did not "live up to Moscow's expectations" and its Syrian commanders "demonstrated poor performance", despite the fact that the corps had actually succeeded in reforming the included militias into a "disciplined, organized military force". Not to be confused with 5th Corps (Syrian rebel group). Fifth Attack Troop Corps, also called the Fifth Legion , is an all-volunteer force, part of Syrian Army involved in the Syrian Civil War fighting against the Syrian opposition, Al-Qaeda in Syria, and ISIS. The task of the corps is "eliminating terrorism" and was formed "in response to the rapid development of events, to support the successes of armed forces and to meet people's wishes to put an end to terrorist acts in the Syrian Arab Republic," according to the statement announced on 22 November 2016 by the General Command of the Armed Forces of Syria. The Fifth Corps of Volunteers will recruit from over age 18 from across the country "not already eligible for military service or deserters". According to Abdullah Soleiman Ali in al-Safir paper, formation of 'Fifth Attack Troop Corps' is the apex point of cooperation among members of Russia–Syria–Iran–Iraq coalition. 5th Corps soldiers are trained, equipped and advised by Russian military personnel since their intervention in 2015. Most main battle tanks of the 5th Assault Corps are modernized Soviet tanks, including the T-62M and T-72B3. The 5th Corps unit, The Ba'ath Legion, was formed from Ba'ath Brigades volunteers. In February 2018, 20 members of the ISIS Hunters (a 5th Corps subunit) died in a US airstrike. The vast majority of Syrian military equipment was Soviet manufactured. Service uniforms for Syrian officers generally follow the British Army style, although army combat clothing follows the Soviet model. Each uniform has two coats: a long one for dress and a short jacket for informal wear. Army officer uniforms are khaki in summer, olive in winter. Certain Army (paratroops and special forces) and Air Defense Force personnel may wear camouflage uniforms. Among the camouflage are Red Lizard, and Syrian Leaf pattern; a locally-made copy of the ERDL. Officers have a variety of headgear, including a service cap, garrison cap, and beret (linen in summer and wool in winter). The color of the beret varies according to the officer's unit. The most common beret color is black, for infantry, Engineering, Signals and supporting arms personnel, followed by Green, for Armored, Mechanized and Artillery personnel, Red for the Republican Guard and Military Police, and Maroon for the Special Forces. In 2011, the standard issue combat helmets were the olive Chinese QGF-02, and the Soviet SSh-68 for the reserve forces. Both of them can be equipped with the "Syrian Leaf" camouflage helmet covers. The Republican Guard and Special Forces were the only units equipped with TAT-BA-7 bullet-proof vests. With the late 2015 arrival of Russian military advisors, many army units were equipped with new Russian 6B45 ballistic bullet-proof vests and Kevlar 6B7 helmets. Commissioned officers' rank insignia are identical for the army and air force. These are gold on a bright green or black shoulder board for the army and gold on a bright blue board for the air force. Officer ranks are standard, although the highest is the equivalent of Colonel General, a rank held in 1986 only by the commander in chief and the minister of defense. Navy officer rank insignia are gold stripes worn on the lower sleeve. The highest-ranking officer in Syria's navy is the equivalent of lieutenant general. Army and air force rank for warrant officers is indicated by gold stars on an olive green shield worn on the upper left arm. Lower noncommissioned ranks are indicated by upright and inverted chevrons worn on the upper left arm. Although some twenty-five orders and medals are authorized, generally only senior officers and warrant officers wear medal ribbons. The following are some important Syrian awards: Order of Umayyad, Medal of Military Honor, the War Medal, Medal for Courage, Yarmuk Medal, Wounded in Action Medal, and Medal of March 8, 1963. August 1 is nationally considered Army Day. In 2013, Syrian President Bashar al-Assad visited soldiers in Darayya. He gave the army a message saying he was sure of victory over the rebels. ^ Syria News 1 August 2013, President Bashar Al-Assad visits soldiers to mark Army Day and pledge victory. 3 August 2013. Archived from the original on 2016-03-24. Retrieved 2015-10-12 – via YouTube. ^ Barnard, Anne; Saad, Hwaida; Schmitt, Eric (28 April 2015). "An Eroding Syrian Army Points to Strain". New York Times. Archived from the original on 2016-07-20. Retrieved 30 April 2015. ^ a b c "The World Factbook". cia.gov. Archived from the original on 2014-07-02. Retrieved 2013-06-15. ^ "CIA World Factbook". CIA. Archived from the original on 2016-03-22. Retrieved 2013-06-14. ^ Morris, Benny (2008), 1948: A History of the First Arab–Israeli War, p. 251. Yale University Press. ISBN 978-0-300-15112-1. ^ Hanna Batatu (1999). Syria's Peasantry, the Descendants of Its Lesser Rural Notables, and Their Politics. Princeton University Press. p. 228. ISBN 978-0-691-00254-5. Archived from the original on 31 December 2013. Retrieved 27 March 2013. ^ Samuel M. Katz, Arab Armies of the Middle East Wars, Osprey Publishing Men-at-Arms 194, 1988, 13. ^ Patrick Seale, Asad: The Struggle for the Middle East (London: I.B. Tauris & Co, 1988), p.327, via Holliday 2013, 12. ^ Nikolaos van Dam, The Struggle for Power in Syria: Politics and Society under Asad and the Ba'th Party, (New York: I.B. Tauris & Co Ltd, 2011), p.114, via Holliday 2013, 12. ^ van Dam, 2011, p.104, via Holliday 2013. ^ a b "Syria's Praetorian Guards: A Primer". Middle East Intelligence Bulletin. Vol. 2 No. 7 (5 August 2000). Archived from the original on 2012-07-04. Retrieved 20 May 2011. ^ a b "Is the Syrian Army Falling Apart?". matthewaid.com. Archived from the original on 2014-01-16. Retrieved 2012-03-16. ^ Norman Schwarzkopf, It Doesn't Take A Hero, Bantam Books, 1993, 467–69. ^ Nicholas Blandford, "Syria reduced troop strength in Lebanon," Jane's Defence Weekly, 29 September 2004, 31. ^ a b International Institute for Strategic Studies, The Military Balance 2010, 272–273. ^ a b c "Syria's diminished security forces". Agence France-Presse. 27 August 2013. Archived from the original on 2014-07-14. Retrieved 14 May 2014. ^ a b c d "Syrian defections hurt army morale". Independent Online (South Africa). 5 July 2012. Archived from the original on 2013-12-09. Retrieved 6 January 2014. ^ "Over 10,000 soldiers have deserted Syria army, says high-ranking defector". Haaretz. Reuters and Deutsche Presse-Agentur. 1 October 2011. Archived from the original on 2013-11-16. Retrieved 6 January 2014. ^ Atassi, Basma (16 November 2011). "Free Syrian Army grows in influence". Al Jazeera. Archived from the original on 2014-01-17. Retrieved 6 January 2014. ^ "Free Syrian Army soldier: "We lack weapons"". France 24. 18 November 2011. Archived from the original on 2013-10-20. Retrieved 7 January 2014. ^ "Syria's army weakened by growing desertions". Reuters. 1 January 2012. Archived from the original on 2015-10-01. Retrieved 2017-07-02. ^ Emre, Peker; Abu-Nasr, Donna (15 March 2012). "Syrian Armed Forces Desertion Said to Surge to 60,000". Bloomberg. Archived from the original on 2013-09-21. Retrieved 7 January 2014. ^ "Chief of protocol at the Syrian presidential palace denies defection". Al Arabiya. 9 August 2012. Archived from the original on 9 August 2012. Retrieved 9 August 2012. ^ "Dozens of Syrian officers defect to Turkey as Russia warns against arming rebels". Haaretz. 14 June 2013. Archived from the original on 2013-06-15. Retrieved 2013-06-15. ^ Holliday, 2013, 11, 12. ^ "DEFECTED GENERAL: 'DRUZE DO NOT REPRESENT A COG IN THE REGIME MACHINE'". Syria Direct. 30 March 2015. Archived from the original on 2015-04-02. Retrieved 7 April 2015. ^ Sherlock, Ruth (7 April 2015). "In Syria's war, Alawites pay heavy price for loyalty to Bashar al-Assad". The Daily Telegraph. Archived from the original on 2015-04-07. Retrieved 7 April 2015. ^ "Israel sees Syrian army growing beyond pre-civil war size". DefenceWeb. Reuters. 8 August 2018. Archived from the original on 11 January 2019. Retrieved 10 January 2019. ^ Holliday 2013, 26, citing "By All Means Necessary: Individual and Command Responsibility for Crimes against Humanity in Syria," Human Rights Watch, December 2011, p. 36; Syrian Observatory for Human Rights Facebook page Archived 2014-03-13 at the Wayback Machine, January 24, 2012; Syrian Revolution Coordinator’s Union Facebook page Archived 2012-07-18 at the Wayback Machine, February 7, 2012; Local Coordination Committees website Archived 2013-04-10 at the Wayback Machine, November 15, 2012. ^ "Council Implementing Regulation (EU) No 1151/2011 of 14 November 2011 implementing Regulation (EU) No 442/2011 concerning restrictive measures in view of the situation in Syria" (PDF). Official Journal of the European Union. 15 November 2011. Archived from the original on 2013-05-22. Retrieved 2012-10-07. ^ Boyd, Henry (12 March 2012). "Shades of Hama and Grozny in Homs and Idlib". International Institute for Strategic Studies. Archived from the original on 2012-06-27. Retrieved 2012-08-11. ^ Holliday, 2013, 42, 46, 47. Holliday's sources include "Skype Interview with exiled former Syrian Army General Officer in Washington, DC on April 19, 2012." ^ Holliday, 2013, 33, citing "Clashes between Syrian troops and army defectors kill at least 13," Washington Post, October 13, 2011; Syrian Revolution Coordinator's Union Facebook Page <facebook.com/monasiqoon>, November 13, 2012. ^ Alice Martins, Watching Rebels Fight Among Themselves for the City of Raqqa Archived 2013-10-29 at the Wayback Machine, SyriaDeeply.org Beta, October 2, 2013. ^ Iran's Secret Army. YouTube. 22 November 2013. Archived from the original on 2016-01-02. Retrieved 2015-10-12. ^ "Insight: Battered by war, Syrian army creates its own replacement". Reuters. 21 April 2013. Archived from the original on 2013-06-01. Retrieved 2017-07-02. ^ "ماهو الفيلق الرابع اقتحام الذي بدأ عملياته في ادلب و ماهي مهامه؟ - وكالة أوقات الشام الإخبارية". shaamtimes. Archived from the original on 2 September 2016. Retrieved 24 May 2016. ^ Richard M. Bennett, The Syrian Military: A Primer Archived 2012-06-29 at the Wayback Machine, Middle East Intelligence Bulletin, August/September 2001. ^ Leith Fadel (17 February 2016). "Syrian Commandos begin encirclement of Kinsibba after capturing 3 villages in northern Latakia". Al-Masdar News. Archived from the original on 2016-03-11. Retrieved 17 April 2016. ^ Leith Fadel. "Four high-ranking jihadist commanders killed in Aleppo". Al-Masdar News. Archived from the original on 2017-02-16. Retrieved 2017-03-02. ^ Paul Antonopoulos. "New Syrian Arab Army Division established in preparation of new offensive". Al-Masdar News. Archived from the original on 2017-02-02. Retrieved 2017-03-02. ^ a b c d Valentin Vasilescu (14 March 2016). "The rebirth of the Syrian Arab Army". Voltaire Network. Archived from the original on 2016-04-17. Retrieved 17 April 2016. ^ "Largest Syrian Brigade Nears Breaking Point". Arutz Sheva. Archived from the original on 2013-06-07. Retrieved 2013-06-07. ^ Fadel, Leith (12 September 2016). "Syrian Army restores all lost points in Golan Heights". Archived from the original on 2016-09-13. Retrieved 2016-09-18. ^ "Syrian commandos begin long campaign to Jisr Al-Shughour". 20 February 2016. Archived from the original on 2016-04-30. Retrieved 24 May 2016. ^ a b c d e f g Pesach Malovany; Nehemiah Burgin (16 February 2018). "Mother Russia Holds the Reigns". Israel Defense (Arrowmedia). Archived from the original on 2018-02-19. Retrieved 18 February 2018. ^ a b c d e f Kirill Semyonov; J.Hawk (2 May 2017). "Syria's Armed Forces in the 7th Year of War". South Front (Russian International Affairs Council). Archived from the original on 2018-02-19. Retrieved 18 February 2018. ^ a b c "Streitkräfte des Assad-Regimes, Februar 2017" [Armed forces of the Assad regime, February 2017] (PDF). Truppendienst.com (Austrian Armed Forces) (in German). 15 February 2017. Archived (PDF) from the original on 2018-02-04. Retrieved 3 February 2018. ^ a b Abdulrahman al-Masri (11 January 2017). "Analysis: The Fifth Corps and the State of the Syrian Army". Syria Deeply. Archived from the original on 2018-02-04. Retrieved 3 February 2018. ^ Nidal Hmadeh (19 August 2015). "The Syrian 4th Regiment...the Full Story". al-Ahed News. Archived from the original on 2018-02-04. Retrieved 3 February 2018. ^ a b Kheder Khaddour (14 March 2016). "Strength in Weakness: The Syrian Army's Accidental Resilience". Carnegie Middle East Center. Archived from the original on 2018-02-08. Retrieved 3 February 2018. ^ Sylvia Westall; Tom Perry (8 October 2015). "Syria extends offensive to retake territory in west". Reuters. Archived from the original on 2018-02-19. Retrieved 18 February 2018. ^ Aymenn Jawad Al-Tamimi (24 December 2016). "The Fifth Legion: A New Auxiliary Force". Syria Comment. Archived from the original on 2018-02-20. Retrieved 18 February 2018. ^ "Syrian army forms volunteer corps to fight militants". Reuters. 22 November 2016. Archived from the original on 2016-12-04. Retrieved 5 December 2016. ^ "PressTV-Syria forms volunteer anti-terror unit". Press TV. Archived from the original on 2016-11-24. Retrieved 5 December 2016. ^ "Syria launches new commando force as war heats up". www.aljazeera.com. Archived from the original on 2016-12-07. Retrieved 7 December 2016. ^ "The Fifth Legion: A New Auxiliary Force". 24 December 2016. Archived from the original on 2016-12-25. Retrieved 2016-12-24. ^ وزارة الدفاع في الجمهورية العربية السورية (30 January 2017). "شاهد رمايات مدفعية الجيش العربي السوري على إرهابيي داعش شرقي حمص وتحرير الكتيبة المهجورة الثالثة". Archived from the original on 2017-01-30. Retrieved 2017-01-30 – via YouTube. ^ Staff writers. "Fifith Attacj Troops Corps entered the Syria civil war". mashreghnews (in Persian). Archived from the original on 2016-12-07. Retrieved 7 December 2016. ^ a b Leith Fadel (11 August 2017). "Pictures of Syrian Army units that will lift Deir Ezzor seige [sic]". Al-Masdar News. Archived from the original on 2017-08-11. Retrieved 11 August 2017. ^ "Syrian regime forms militia mostly from the ruling party". Zaman Alwasl. 16 March 2017. Archived from the original on 2017-03-17. Retrieved 17 March 2017. ^ a b c "Uniforms and Rank Insignia". Library of Congress. April 1987. Archived from the original on 2017-02-02. Retrieved 2018-11-30. ^ "Syria Ssh68". Brendon's Helmets. Archived from the original on 2013-03-30. Retrieved 2013-07-12. ^ "PressTV-Assad inspects troops on Syria Army Day". presstv.ir. Archived from the original on 2013-08-11. Retrieved 2013-08-02. Richard M. Bennett, The Syrian Military: A Primer, Middle East Intelligence Bulletin, August/September 2001. Joseph Holliday, 'The Assad Regime: From Counterinsurgency to Civil War,' Institute for the Study of War, March 2013. Seemingly the best concise description and analysis of the Syrian Army and its involvement in the current Syrian Civil War. Department of the Army, Area Handbook for Syria, Washington, For sale by the Superintendent of Documents, U.S. Govt. Print. Off., 1965, "Department of the Army pamphlet no. 550-47." Revision of the 1958 edition. Pesach Melovany, Out of the North an Evil shall break forth, Tel-Aviv: Contento de Semrik, 2014. Kenneth M. Pollack, Arabs at War: Military Effectiveness 1948–91, University of Nebraska Press, Lincoln and London, 2002 reviewed in Brooks, Risa A. "Making Military Might: Why Do States Fail and Succeed? A Review Essay." International Security 28, no. 2 (Fall 2003): 149-191. History of the Syrian Arab Army: Prussianization of the Arab Army, the Arab Revolt of 1916–1918, and the cult of nationalization of Arabs in the Levant after World War I, Infantry Magazine, Nov-Dec 2005. General Mustafa Tlas (ed. ), History of the Syrian Arab Army/Al-Tareekh Al-Jaish Al-Arabi Al-Soori, Volume 1: 1901–1948, Center for Military Studies. Damascus, 2000. Volume 1 is 568 pages long and covers the Arab Revolt, the short-lived monarchy under King Feisal bin Hussein, the French Mandate, the 1948 Arab-Israeli War and finally Syrian independence in 1949. Wikimedia Commons has media related to Syrian Army.